Our fantaistic sponsor this week is CRAFTY RIBBONS who is offering a £10 gift voucher. I loved making this card and had to share it with you all and I love the red organza ribbon I used. I used the Taylored Expressions Holly Cutting Plate to create my background then layered it on the glittery silver cardstock. I used the Taylored Expressions Label Stacklets 1 for my sentiment panel - cutting one from kraft card then the next size up from red cardstock. 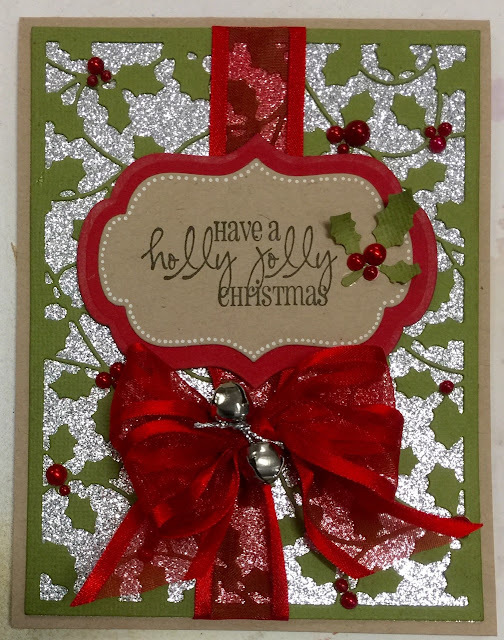 I embellished the kraft label with a white gel pen for the dots around the outside and then a small sprig of holly leaves and red pearls. The sentiment I used was from CC Designs - AmyR Stamps Handy Christmas Greetings. I have then wrapped the ribbon around the background piece and then added a double bow and some little sliver christmas bells. We hope you will be able to join us in with our challenge this week. We look forward to visiting your blogs and seeing your gorgeous creations. Please be sure to post a link back to Fab'n'Funky Challenges in your blog post in order to be eligible for this weeks prize! The deadline for entries is Tuesday evening (8 pm GMT ). So all that's left is for you to get creative and link up your entry to the linky at the bottom of the page. So beautiful, love your gorgeous bow & bells. I adore your card design! So very pretty! Beautiful Christmas card Kristina and that bow is just gorgeous.